Reed Park opened in 1892, making it one of Santa Monica's oldest public parks. Over the past few years, the park has been renovated in phases, including an overhaul of the playgrounds, landscaping along Wilshire Blvd, new gardens next to Miles Playhouse, new signage, and general updates to the park buildings. 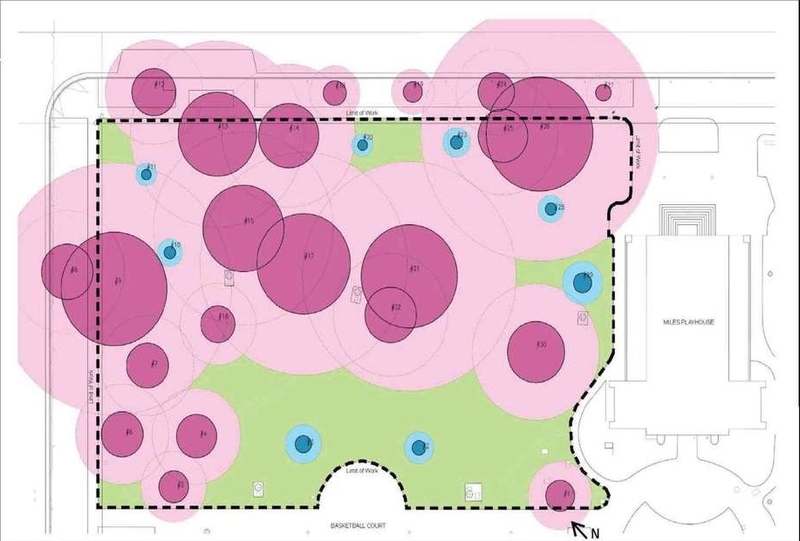 In this final phase, the lawn in the northeast quadrant was redesigned to better connect with the rest of this active park and meet community needs. Now, the playgrounds at Reed Park are undergoing a refresh. The south playground received new safety surfacing and is now open. Next, the sand will be removed from the north playground and replaced with safety surfacing. The north playground is expected to be closed through mid August. The playgrounds at Reed Park are undergoing a refresh, just in time for summer! Work on the final phase of Reed Park improvements is set to begin. The project is anticipated to be completed by December. Note: We're happy to report that no healthy trees will be removed as a result of this project. Some of the smaller trees in the project area may be moved to other spots in Reed Park. All of the mature Eucalyptus trees will stay where they are. The results are in! We received 144 responses to the Reed Park user survey that was open from December 5 to December 31. A community open house on January 21 will provide another opportunity to share ideas. All input will be considered as the concept design options take shape. We anticipate presenting these options this Spring. The first community workshop on improving the Reed Park lawn will be held on site on Saturday, January 24, from 10 am to noon. Drop by and let us know how you would improve this space so it better connects with the rest of this active park. The lawn at Reed Park will be the focus of the final project in a series of improvements to one of Santa Monica's oldest parks. The project design phase will kick off with an online survey, and followed up by 2 public workshops. Santa Monica, we need to hear from you! An update to the lawn area in the northeast section of Reed Park will be the last in a series of improvements at Reed Park, one of Santa Monica's oldest parks. The public input phase will kick off in December, starting with an online park user survey. In addition, two public workshops will be held in early 2015. Community feedback on ways to better connect the lawn with the rest of Reed Park and meet user needs is critical to a successful design. Katherine Spitz Associates has been chosen to design the final project in a series of improvements to Reed Park, one of Santa Monica's oldest parks. 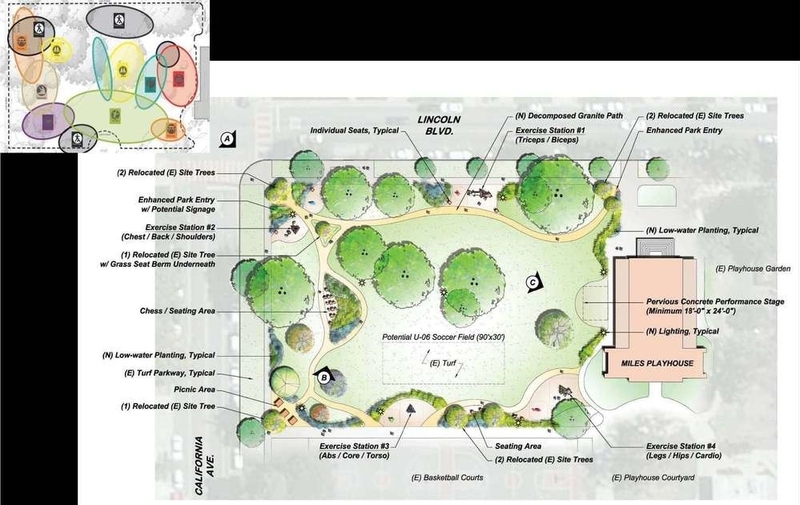 The firm will focus on ways to better integrate the 1 acre lawn area in the northeast corner with the rest of this 5.3-acre park and meet the needs of park users. Improvements are planned for the northeast section of Reed Park, which is approximately 1 acre in size. Structural root zones (dark pink) are essential for tree stability. Loss of roots in this area are likely to cause trees to become unstable in the ground. Critical root zones (light pink) are necessary to maintain the life of trees. Blue represents trees that are candidates for being transplanted within Reed Park. Note: No healthy trees will be discarded and the historic Eucalyptus trees will not be disturbed. The design concept features a flowing walking path that provides easy movement throughout the park, exercise stations, individual seating, a picnic area, and chess tables. A sizable turf area that could support a soccer game for young children and other passive and active recreation activities will be maintained.